It won't go on sale in Europe for a couple of months yet, and the time you can buy one in America-spring 1989-is a bit further away. But this much is clear about the new Corrado: It's the Ben Johnson of the Volkswagen fleet, an athlete with plenty of muscle and speed. And yet this new $20,000 sports coupe from Wolfsburg doesn't strut its best stuff outwardly. Instead, the big news is under the Corrado hood. And there's not even anything unusual about the basic specifications here: a 4-cylinder engine with 81.0-mm bore, 86.4-mm stroke, 1.8 liters of displacement and only two valves per cylinder. But wait there is something to write about. and it's signaled by that "G" after Corrado. This is the first car to go into full-scale production with what the Germans call a G-Lader, a mechanically driven spiral supercharger. Actually, VW has been working on the spiral blower for eight years. A pilot series of 500 of VW's smallest German model, the Polo, has already been built and sold with the G-Lader. There's also a corporate-policy dimension to this power-boost technology, in that Volkswagen seems to have drawn a line of demarcation between the VW and Audi emblems: spiral superchargers from Wolfsburg, exhaust turbochargers from Ingolstadt. (Except for diesels, that is, which get turbos in both camps.) In the spiral supercharger, the engine's intake air passes through a snail-shaped housing, where it is compressed by a fast-turning spiral impeller to about 0.7 bar above atmosphere. This compressor, which itself soaks up as much as 18 horsepower, is driven by a toothed belt. The device's big advantage is torque, right across the engine's rev range. Rumor from Wolfsburg has it that the Corrado engine delivers more than 200 Newton meters from 3000 to 5000 rpm and reaches a peak torque of 220 Nm-that's 162 lb-ft, or about what you'd expect from an unblown engine of 2.5-2.7 liters. But as with anything else, there are disadvantages too. By the time the engine is churning out maximum power, 5800 rpm, that little spiral is whirling at around 11,000 rpm. And there's not much margin of safety beyond that; the impeller is getting very close to critical vibrations. So this is a power booster that would make little sense for a Formula I engine, for instance. But for an engine whose job is to deliver good work in daily driving, it makes great sense. VW is so convinced of this, in fact, that you'll be seeing more spiral superchargers from Wolfsburg. About the time you read this, the company will be producing a second series of 1500 Polo G 40s, as they're called. A bit later there will be a Passat G 60 and a Golf G 60 and eventually the Polo G 40 will go into full production. Those numbers after the G, by the way, stand for the spiral blades' width in millimeters. And between Golf, Passat and Corrado-all of which use the G 60 supercharger-there are nuances of difference as well. In the new Passat, for instance, the blower draws its air through that stylish new VW emblem gracing the otherwise unadorned front end; in Corrado and Golf the air comes in through the right front fender. Whatever the air source, the power boost is eye-opening. Fully emission controlled, the G 60-blown 1.8-liter four puts out 150 bhp. And if what we hear about the performance is true, the Corrado G 60 may make most of its competitors look like snails: 0-60 mph in well under 8 seconds, for instance. Just for comparison: The Porsche 924S, which costs about $5500 more in Germany (and $26,550 in the U.S.), takes 8.5 see for the same exercise. And the 944, which comes to $30,995 in the U.S., takes a full second more. When it comes to top speed, the Corrado's 137 mph line it up squarely with the 924S's 137 mph and the 944's 136. That the Porsches, with 158 bhp to work with, just match the Corrado's top speed may be traceable to somewhat better aerodynamics for the Corrado. If the Corrado winds up looking a bit round and puffy, VW's designers (under Herbert Schaefer) compensate with a reasonably nice drag coefficient-0.32,, versus the 924S's 0.33 and the 944's 0.35-an even nicer overall drag factor (Cd x A) of less than 0.6 square meter. For comparison, the present S presents a 0.68-square-meter face to the wind; the Porsche 924S comes in at 0.58 and the 944 at 0.66. An eye-catching Corrado aerodynamic detail, shared with the new Porsche 911 Carrera 4: a movable rear spoiler that automatically rises into position at 75 mph, then retracts when the car slows to 25 mph. Speaking of Scirocco, we were surprised to learn that the older coupe won't be discontinued when the Corrado makes its debut. Critics say the Corrado is so expensive to produce that it can't totally replace the S. From what we hear, in Germany the Corrado G 60 will have to be priced about $5500 higher than the most expensive S, the GTX 16V, whose tooling is long since amortized. This points up a growing problem for German carmakers: Saddled with the highest costs in the world, they're struggling to stay competitive and it's not going to be easy. Mind you, the Corrado won't be merely more expensive than its ancestor. It sits on a wheelbase almost 3 in. longer, is about 2 in. longer overall and 1.6 in. wider, and rides about an inch lower than the S. It's said to be about 8 percent roomier too. All this is no surprise when you're reminded that where the S is still based on the old original Golf (Rabbit), the Corrado platform is that of the present Golf II. Corrado's instrument panel and steering wheel are similar to those of the new Passat. The steering wheel will be adjustable; a short shift lever, connected to the same 5-speed gearbox used in the Passat, grows out of the center console. The Corrado is clearly a 2+2, but that doesn't mean its rear seats are only theoretical-there really is room for people here. Just the same, leg room is tight, so longer trips are probably out of the question for adults, except possibly cats and fakirs. Folding the rear seatbacks approximately-doubles the 12.2cu-ft cargo space. Chassis components are mostly from the Golf GTi 16V, with MacPherson struts at the front and the typical VW twist beam at the rear. New here are 15in. running gear- 15 x 6J wheels, 185/55VR-15 tires-and big brakes; at the front are hefty 10.1 -in. ventilated discs, and at 9.0 in. the solid rear discs are also quite respectable. There won't be the palette of engines and trim levels that European customers usually have to choose from. So far the only engines Volkswagen plans to offer are the 1.8-liter G 60 and the present 16 valve engine (136 bhp in non-catalyst, 123 bhp in catalyst form). The U.S. version of the Corrado will get only the G 60 engine. Insiders also say some lower-power engine alternatives may be offered later, at least when S sales tail off-an event that has long since occurred in North America. It also seems possible that VW's fascinating new "inline V-6" engine, an extremely narrow-angle V-6 that displaces 2.4 liters and develops 170 bhp, might find its way into the Corrado. And since VW already offers 4wd in the Golf, why not in the Corrado too? What won't be offered is a design concept favored by Schaefer, a sort of fast-back sports wagon (something like Volvo's 480ES) that was turned down by management. Another variant seems to have a better chance: a Corrado cabriolet that was only recently shown to VW's management product-strategy committee. With or without cabrio, the Corrado will be built at Karmann in Onsabruck, where the present Golf/Rabbit cabriolet and S are assembled. 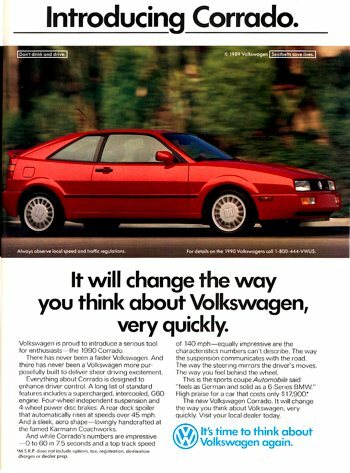 Seen in context with VW's plans for Karmann to build only about 100 units a day, this indicates that VW doesn't see the Corrado as a volume seller; it's an "image car" that VW hopes will lend its name and other models greater prestige. Mention the word Volkswagen and what do people think of? They think practical. They think affordable. So, what's the problem? They don't think sports car. But just suppose you could take everything you love about sports cars and all the good things about Volkswagens and put the two together. What would you have? A sports car that is fun yet sensible. Beautiful yet functional. Powerful but responsible. In short, you'd have the new sports car from Volkswagen: Corrado. If your mind has difficulty accepting that fact, perhaps your foot will understand. Press the accelerator and the Corrado takes you from 0 to 60 faster than you can say "What seems to be the trouble, officer?" Its time of 7.5 seconds is considerably faster than a Porsche 944. And its top track-speed of 140 is higher, too. Instead of being turbocharged, Corrado is supercharged. Result: It eliminates turbo-log. And provides a steady infusion of power. From the time you turn the key until you hit the redline. A supercharged, intercooled power plant gives Corrado's engine the torque and response of normally aspirated engine with nearly 50% more displacement. Corrado not only looks like a sports car. It drives like one. Perhaps because it is a wish list of everything our engineers wanted in a sports car. Like a speed-activated spoiler which automatically extends when you need it. By reducing rear lift by up to 64%, it increases high-speed stability and directional control. Question: How important is this spoiler? Answer: Important enough to be on Formula 1 cars and the Porsche Carrera 4. Corrado also has the largest passenger compartment of any car in its class. So the backseats are more than theoretical. As for the trunk, it holds more than a big Mercedes'. Yet for all its room and comfort, Corrado is first and foremost a driver's car. You won't find the usual jumble of faux fighter pilot paraphernalia here. Rather, an environment engineered to inform, not entertain. One that is surprisingly quiet. Thanks to a Volkswagen innovation called a decoupled longitudinal beam. In the event the peace and quiet gets to you, there's always the premium Heidelberg sound system with six speakers. 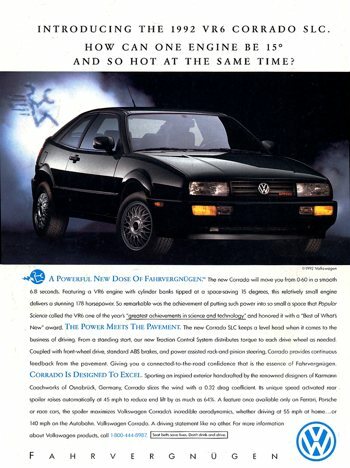 In fact, Corrado has everything from a trip computer, air conditioning, height-adjustable steering column, cruise control, power windows, door locks and mirrors, to 15" alloy wheels and fog lamps. All standard. As you might expect, this kind of sports car isn't mass produced. Corrado is built in limited numbers by one of Europe's last great coachworks, Karmann. Enhanced by perhaps the greatest technological breakthrough of all time. The human hand. A thorough examination will tell you that the art of custom craftsmanship and attention to detail is still being rigorously practiced. Given the fact that production is limited. Given the fact that Corrado is only $17,900. We suggest you visit your Volkswagen dealer. And experience all the engineering that makes this very special sports car a Volkswagen. $17,900. It's time to think about Volkswagen again. * MSRP excludes taxes, license, freight, dealer charges or options. Prices subject to change. For details call 1-800-444-VWUS. Copyright © the author. Published under Fair Use. Comments on "Sneak Preview: Volkswagen Corrado G60"